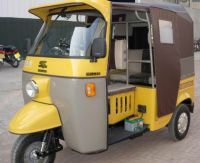 Its been a years gap for me and I was very very startled to take the Karachi traffic, for one the biggest menace are rickshaws – the bright yellow CNG ones. They are literally everywhere, swerving in and out with no sense of law, order or traffic rules – The driver is just there thinking he has a machine that can even work against the forces of nature. Now don’t take it that I am very against the rickshaw, It’s a nice little taxi for thin and tight spaces. But it should be only confined into those type of spaces and areas. Not on Public roads with speeds above 30 km/h. Firstly it’s a very very unstable vehicle – 3 wheels can topple over quickly with the slightest of bangs – and the crown is that its very very very unsafe for the passenger in any sort of crash – let alone seat belts or airbags or side impact beams the things rear seat is the end of the vehicle – any slight crash and your passenger is a corpse or at least a vegetable. How can the road and traffic authorities allow something so unsafe onto high speed public roads. It should be confined to run on the little parallel roads we have everywhere in Karachi – we call them service roads too – their speeds are residential and are usually running parallel to the actual main road. It is more at home in small towns and villages where the usual speed of a vehicle is 20 to 25 km/h – plenty for this machine – Its high time some authority shed some light on it, as if left unattended it will become a plague very quick. Now I know we will see some Goody twoshoes chime in speaking of the poor chap whos making a living from it – Im not against that – everyone has to earn to live be it rickshaw driver, sweeper, road traffic warden or anyone at all infact, it’s just that they have their respective confines and limits in which they operate.